Sunday morning I woke up to a fright…well sort of a fright. Mollie’s first words to me were “I think the fridge went out.” While there are worse things in the world, when it comes to an appliance going out in your house the only one I can think of that is more frustrating than the fridge is the air conditioner. Air conditioners always go out during a heat wave in July or August. When the fridge goes out it always happens right after your bi-weekly trip to the store. It involves working to save your food, calling every hunter you know to borrow the biggest coolers you can find and repeated trips to the store for ice for however long it takes you to get it fixed or buy a new one. Upon further inspection, and to my relief, I discovered that the fridge was still working. The good news, it was only the light bulb that had burnt out. Now the bad news… THE LIGHT IN THE FRIDGE HAD BURNED OUT!!! I never realized how important that little light was. A refrigerator is a dark place. You can find stuff in the door and those items up front, but the pickles tucked away in the back are impossible to find. And leftovers without a light can be dangerous. You are basicly taking your life in your own hands. Is that styrofome container you are grabbing the leftover shrimp from your date night last night, or the leftover shrimp from your date night last month that you forgot was back there? One is a tasty lunch, the other a prelude to an evening in the bathroom bowing at the porcelain altar praying for death. Life without God is like looking in fridge with a burned out light bulb. Sure it works, but you can’t see what you are doing. You fumble around looking for something you know is there but you just can’t seem to find it. And when you think you have found something that will satisfy your hunger it turns out to be spoiled take out from a few weeks ago and only makes you sick. Replace the light in the fridge; it will only cost you about five bucks. And if the light has burned out in your life, if you are a church drop out or never been involved in a church, find a good church home in your area. It is not smart to go through life eating the wrong stuff when all you need is a light bulb. On Monday morning I got a call from my son Braiden. He sounded a little concerned and I immediately knew why he was calling. It was Mollie’s birthday and since he had been a friend’s house Saturday when I went shopping he had yet to get his mom a gift. He want to go to Kohl’s and look for some jewelry. I told Braiden to be ready by 11:30 and I would swing by the house and grab him for lunch and then we could do some shopping (one of the joys of home schooling, off campus lunch). I took the opportunity to introduce him to a Victoria institution known as Jim’s Big Burger. If you are a native Victorian you know Jim’s Big Burger, located on Glasgow just inside the Northcrest subdivision. It seems like an odd place for a burger joint until you look at a map of Victoria 30 years ago when Northcrest was way north of town (hence the name "North" crest) and Jim’s was the only restaurant for miles. Next to Dairy Treat it is the best burger and fries in town. We ordered at the counter and then grabbed a booth. I like Jim’s not just for the burgers but for the slick tables that are perfect for playing paper football while you wait for your food. I found Chipotle menus make the best paper football EVER!! and I carry one in my wallet that I have had for years. The game is played until your food comes and whoever is ahead at that time is the winner. I was at a disadvantage because there was an older couple sitting at the table behind Braiden which meant I had to be careful kicking field goals when Braiden had three off’s. I did not want to bounce the "ball" off the side of one of their heads, although their thick glasses would have prevented any serious eye injuries. Even with my handicap I beat Braiden 108 to 93 (Jim’s makes everything fresh and is busy at lunchtime so we had a long game). We had a blast talking about everthing from school to the new Star Wars Clone Wars series to the MLB playoffs. Now Braiden is angling for us to have a standing Monday lunch, something I have been planning on doing for some time but have just have not gotten around to putting on my calendar. One of the neat things that Mollie’s dad did with her growing up was regular “dates”. Taco Bell was their restaurant of choice. It bacame such a special tradition that the night before our wedding Mollie and her dad had one last late night snack togather at Taco Bell. Not sure where Braiden and I are going for lunch on Monday, but I have my paper football ready. Maybe a little more than a decade from now Braiden and I will be sitting at a restaurant somewhere the night before his wedding talking life and playing one more game of paper football. Wouldn’t that be something? One Green Thing Every Decade. Comedian David Brenner use to joke “My mother was always on me to eat my vegetables. She would say ‘everyday eat a green thing, eat a green thing‘…so I use to go around picking the moss off trees.” I understand how he feels. Notice the word “green” starts with the letter “G”… …so does the word “gross”, coincidence…I think not. Between age 0-10 I did not eat green things, or any vegetables for that matter…flat out refused. Oh, I did eat peas…sort of. When I was about five years old my parents put a few on my plate and I ate them, well I swallowed them whole. According to my parents however eating involved chewing, and tasting, and that was not happening. Three house later they realized that I would sit at the dinner table until I to leave for school the next morning before I would chew up and swallow a pea. I went years without eating green things, but then in my teen years I started eating salad. I don’t remember why, I just did. It was loaded with cheese, croutons and sunflower seeds but there was some green stuff in the bowl somewhere. In my 20’s I tried some zucchini at Olive Garden. It was deep fried and just about anything deep fried is edible in my book. Then recently Mollie and I went to Mexico and since we were out of the country I just went crazy and tried avocados in the form of guacamole. Now I can not get enought of the stuff. No plans on trying anything new in the near future. Now I am looking for new ways to prepare the few green things that I like. This summer I grew some massive zucchini in my garden, after I squashed all the "Squash Ladybugs" that were eating my plants (see the post "On Earth Day Bugs Bugging Me" from last spring). My zucchini three to four times bigger that what you find in the store. I cut one of them into “steaks”, brushed on some olive oil and dusted them with garlic salt, black pepper, and Italian seasoning and threw them on the grill. Then I made some Gorgonzola Cheese butter to drizzle over the zucchini after it was plated (o.k. I have been watching way too much Food Network). This goes great with my homemade Pesto made with basil fresh from my garden. Basil is an herb so it does not count as the fourth green thing in my diet. Since it seems that I add one green thing to my diet every decade in a couple of years I will be looking for something new to try. I am currently taking suggestions as to what that green thing might be... and Mollie tells me whatever it is can’t be deep fried…Drat!! Any body have a moss covered tree in their yard? Mollie completely surprised me on Friday with a date night. She left a note on my pillow that morning that I was a complete moron and did not read. Oh, I saw it, but just assumed it was a sweet note to get me out of the funk that I was in. I was enjoying being a grump so I was going to save it. At 5:15 PM Mollie comes up to me all dressed up and says “I leaving”. Great, a date…oh great, I had less than half an hour to get ready!! Oh wait, I am a guy, thirty minutes to get dressed is an eternity. I was good to go before she got back and even had 23 minutes to spend on the computer. We had a great evening. First we went to Greek Brothers for dinner. I love their steaks because they know the difference between Rare, Medium and Medium Well. Even better than the food was the conversation, Mollie and I got to sit across a table from each other and talk without anyone (i.e. the kids) interrupting us between sentences. One of our unwritten date night rules is that we don’t do dinner and dessert in the same place so we dropped the top on our cute little car (which is awesome for date nights) and headed downtown to Longleaf Coffee & Bakery Company, our hometown coffee shop that has homemade cheesecake and pies that are incredible. We sat at a table outside on the sidewalk, watched the traffic come down main street and talked. Of course as we sat there we saw about eight people we knew. When Longleaf closed about 9:30 PM we went cruising. Yes cruising, just like in high school. We drove through downtown, up Navarro, through Sonic, around the Mall, circled the movie theater, and then headed for Riverside Park. Back in high school the “bends” at the park were popular hangout spots. Today the “bends” at Riverside Park, “Grover’s Bend” now F.B. Lowery Dr & “Fox Bend” have been closed to vehicle traffic so the big loops we use to cruse are off limits, but you can still drive a little way down. We found a spot in Fox Bend, turned off the engine and just sat there, listening the frogs and the wind in the trees. With the top down on the car we could look up at the stars and the moon, see the deer (about 13 of them), and stare in amazement at all the lighting bugs. We also were constantly looking over our shoulders for the Ax Murderer we just knew was sneaking up on us as we sat there talking. That is what we did all evening , talk and reconnect. It was a great date. 1. Have a date night at least once a month. Sometimes plan it together, but guys let me tell you, if you arrange the sitter, make the reservations, and plan out the whole evening for your wife it will usually end well for you…and yes that is exactly what I am saying. 2. Dinner should be at a restaurant that is not too loud so you can talk. This usually rules out any place with a live band. 3. When you go out you have to sit across the table from each other, so you can look at each other and talk. I can’t tell you how many times we have been out and seen a couple sitting in a booth next to each other and not say a word to one another the entire meal. 4. No Movies!!! I know you are saying “What!? !” There is no conversation in a movie, therefore no connecting. O.k., you can do a movie or the theater as long as you spend time at dinner before and dessert afterward in conversation. So what do you do to reconnect? Do you have regular date nights or time away together? If you have not been on a date with your spouse in awhile I challange you to plan one this week and surprise them. I recently had a brush with death, one of the most scary experiences in my entire life. And NO, it had nothing to do with my motorcycle. I was watching game one of the Spurs/Lakers series. The game was in LA so it was on later than usual, about 11:00 PM, and I knew I should not be eating anything, but a game is just not a game with out snacking. I got a glass of ice tea (my drink of choice) and grabbed a bag of chips from pantry. They were Julios Corn Tortilla Chip, something new my mom found and liked so she got me a bag. They had a different seasoning with a hint of lime, not at all like any tortilla chip I have had before. Did not particularly like them but unconsciously keep eating as the game progressed. Then it happened…the unthinkable…I thought I was going to die. Somehow the Spurs blew a 20+ point lead in the 3rd quarter and lost the game!!! My two favorite teams lost, the Spurs and anyone playing the Lakers. Disgusted I went to bed. Little did I know what was coming next. I was sound a sleep and dreaming, when all of a sudden I snapped awake. It was about 1:30 AM and there was a burring in my chest that went all the way up to the back of me throat. It tasted like those chip I was eating. I felt like I was going to throw-up so I sprang from the bed for the bathroom. About the time I found the toilet I came to a frightening realization, I could not breath. My throat was not only on fire it had closed up. Seriously, no oxygen was getting through. It dawned on me that it must be acid reflux (which I have never had) combined with an allergic reaction to those stinking tortilla chips!! I thought “great, this is how I am going to die“, not on my motorcycle, not getting hit in the head with a softball, not in a deer blind, but with my head in a toilet killed by an allergic reaction to some bad tortilla chips. I have friends that are allergic to nuts, bee stings and shell fish among other things. They all carry an EpiPen, which is this big honken horse needle with a massive syringe looking thing filled with epinephrine (a.k.a. adrenaline) that you take and jab into yourself when you have an allergic reaction. I use to think “There is no way I could stick that thing in my leg!! I would rather just die!” Let me tell you, that night doubled over the toilet not being able to breath I was thinking “Give me a damn EpiPen!! !” I would have jabbed it where ever I needed to if it meant breathing again. I did not care where, my leg, my arm, right or left cheek (uper or lower set), my temple, my eye, name the body part and I would not have thought twice about pulling the gray cap and driving it home. (For a funny YouTube demonstration on how to use a EpiPen with a Star Wars twist click here). To see a guy use one for the first time click here. This went on for about a minute until my throat stated to open back up and I was able to breath and speak again. it was about ten minutes before I could breathe normal. Once I got some deep breaths I went back to bed, but my throat was still on fire with the taste of those chips. The next morning Mollie and I were talking about my episode. I mentioned how I wish we had an EpiPen cause I was so desperate to breath that I would have stuck myself. Now normally I end my blog with some profound thought, life analogy or funny twist. There is one here, I know there is, however right now I am still freaked out that I almost became the poster boy for having an EpiPen handy around the house and knowing where it is. O.k. now that I know where it is somebody pass the chips, (just not THOSE chips). Thursday night I really wanted some chocolate chip cookies. Our neighbor had given us some pre-formed frozen cookie dough but a quick survey of the freezer found a box of Oatmeal Raisin (waste of a good cookie…seriously, I hate raisins, they rank right up there with the Philadelphia Eagles in my book), and a box of sugar cookies, but no chocolate chip. Well as my daughter says, “We will just have to improvise.” How a three year old came up with that phrase I have not a clue. It was not just that she said the word "improvise" but that she used it in the proper context. She just says things like that. This week watching Braiden play one of his video games she commented to me “Dad, bad guys aren’t good.” Anyway, back to the cookies. Now I love to cook so I know what is in the pantry at any given time. I remembered that I had about half a bag of Nestle Toll House Chocolate Chunks from my last batch of Bard’s Best Oatmeal Chocolate Chip Cookies in the World(no raisins allowed). Cookie dough and chocolate, what more do you need. Would it work? How would they taste? I had no idea, but it was worth a try. I let the sugar cookies thaw out a little then started shoving chunks of chocolate into each chunk of dough and popped them in the oven. 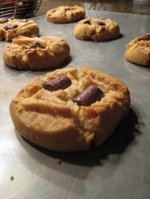 Did you know that is pretty much how the chocolate chip cookie came to be. In 1924 Ruth Wakefield, a great cook and owner of the Toll House Inn, was making her well known Butter Drop Do cookies when she ran out of baker’s chocolate, so she improvised. The only thing she had was a semi-sweet chocolate bar which she cut up into little pieces. Instead of dissolving the chocolate just softened. Oh, and the chocolate bar she cut up was a gift from Andrew Nestle. The cookies became so popular that Ruth and Nestle struck a deal. Nestle was allowed to put Ruth’s Toll House cookie recipe on their packaging and Ruth received a lifetime supply of Nestlé’s chocolate. The lesson here is don’t be scared to try something. What is the worst that can happen. It might not work… but then again it might be turn out to be something incredible. As for my sugar cookies with the Nestle chocolate chunks, well lest say improvising never tasted so good.